How To Retire Sooner and Richer? The mindset of today’s young professionals is changing radically. They would like to have a semi-retired life in their late forties or early fifties by taking up a hobby instead of a regular job. Somewhere within all of us, there is a dream to reach a point in life where we have enough Wealth to be able to choose the work we would like to do and the pace at which we would like to work, if at all we feel like working; a point also referred to as financial freedom. Financial Freedom is also interpreted as being able to spend whatever amount you like, on whatever things you like, month after month. Here is a step by step guide to Retire Early. How long you expect to live? First of all, you need to decide on “How long you expect to live?” This is going to be the starting point for your retirement plan . This you can decide by your health history and your family health history. You need to accumulate enough money required to live up to that age. 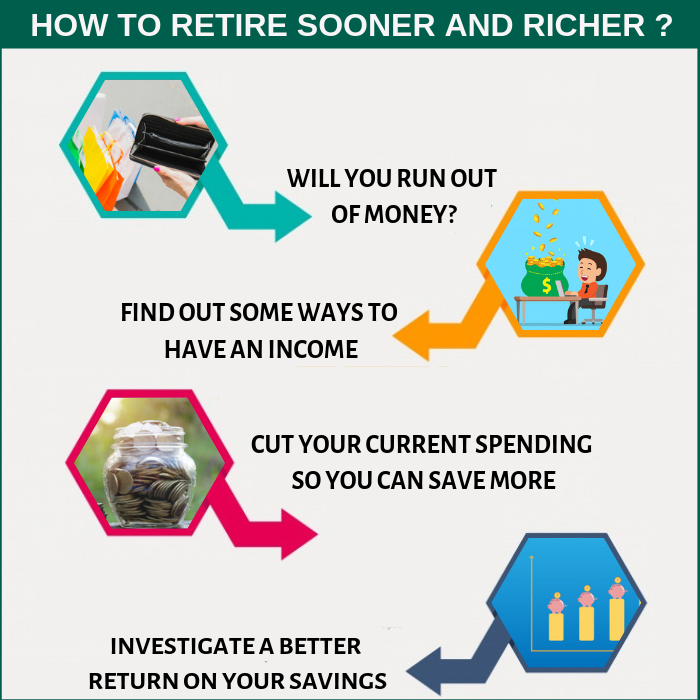 You need to calculate the corpus amount required for retirement based on when do you want to retire?, how much you need to spend every month after retiring?, Inflation, tax, investment returns and the like. There are two things which can make you run out of money in between. One is inflation and the other one is medical expenses at the old age. So you need to be very careful in assuming inflation when planning for retirement. Also you need to be adequately covered with right health insurance policies. You need to divide your retirement corpus into two portions. One portion of it is the corpus required to retire at the regular age. It could be 58 or 60. The other portion is the corpus required to live between the early retirement and the regular retirement. Say if you want to retire at 50, what would be the corpus required to live between the age of 50 and the regular retirement age of 58 or 60. First you need to accumulate money for your regular retirement. Then you need to proceed to accumulate for your early retirement. This way you break your targets and it psychologically gives you a lot of comfort in achieving early retirement. To retire early, definitely you need a sizable corpus. Don’t look for any short cuts and get-rich-quick schemes. Only with the increased risk comes the increased return. If any scheme assures low risk and high return, then it is going to be another scam. So stay away from those schemes. You need to consider investing in a well diversified portfolio for long-term. Diversified Equity mutual fund schemes are better. By investing in a diversified equity Portfolio you will be taking calculated risk and not blind risk. Equities will beat all other asset classes in the long run. So it is an important option for those who want to retire early. Reduce your annual cash requirements for when you retire by working out a careful budget . The monthly income required after retirement is going to be an important criteria for deciding the retirement corpus. If you are comfortable with lesser income you can retire sooner. So you need to be careful in drawing a budget for cash requirement post retirement. Better return on your investment portfolio will help you retiring early. So maximize the return on your portfolio as far as possible. Money spent is money saved. Spend less; save more; invest smarter and retire sooner. There are more number of ways to spend smarter to save more. Earn more now. Time is money. Don’t waste your time. Invest your time in revenue generating activities. Apart from your regular income source, there are other opportunities which you can exploit. You can create blogs; you can be a freelance writer; you can do internet marketing. There will be numerous opportunities based on your knowledge and skills if you take time to think and implement. Tax deferment is an important tool for early retirement. Tax deferment means less tax now. If you pay less tax and you will have more money to save. You need to pay tax on FDs on maturity even if you renew them. Income funds and MIPs could be a better alternative to this. You need to pay tax only when you actually redeem. Even after retirement you can have an income by way of a hobby or interest. You need not work on a regular schedule. Say you can be a trainer, you can be a blogger, you can be a consultant, or you can be an advisor in your chosen field. It generates money as well as it keeps you engaged after retirement. One of my clients has written a book and he is able to generate income from the copyright of that book year on year. If you are able to generate this kind of income, then you can retire early. Retiring early is possible for each and everybody. You need to start planning for it little earlier. Professional assistance from financial planners will be of definitely useful to you, if you desire to retire sooner and retire richer.